Kathy, chances are you have a faulty anti-siphon trap vent device (ASTVD) under that sink. It’s a small ABS plastic fitting found near the P-traps under most RV sinks. Its purpose is to allow air into the drain system to help drain the sink, at the same time it prohibits gases and odors from coming in from the holding tank and drain piping. It is constructed with a spring-loaded rubber diaphragm. Oftentimes this rubber membrane will dry out and not fully seal against the rising odors out of the waste system. Other times, the spring simply wears out. If you look under your sink and follow the horizontal ABS piping as it leaves the P-trap, you’ll likely find the ASTVD situated a few inches above this horizontal arm. It’s a simple, screw-on fitting. In some cases, the rubber membrane can be renewed by applying a lubricating grease; I recommend Dow 111 grease. It’s a relatively inexpensive component and is easily replaced by any RV handyperson since it does not require any sealant and is only hand-tightened in place. They can be purchased or ordered through any RV parts department or even on-line. 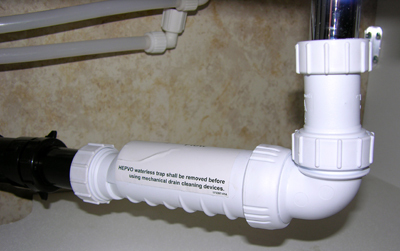 Another thing to consider, especially if you need a little more room under those sinks, is to replace all the P-traps with a HepvO waterless sanitary valve. 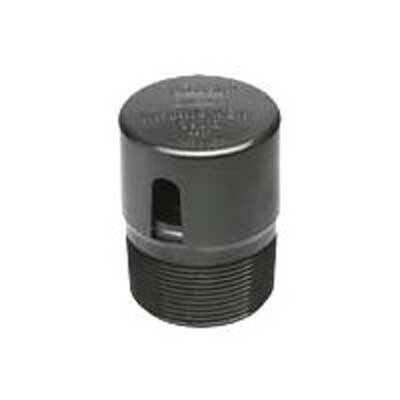 When using a HepvO valve, an ASTVD is not needed at all. Plus there is zero maintenance (no winterizing, cleaning, etc. ), when using a HepvO valve. But one of the biggest benefits is the added storage space under the sinks. This is the route I highly recommend! Read all about the HepvO waterless sanitary valve. Also, while we're on the topic, here are my recommended holding tank dumping procedures, which also mention the HepvO. And since I’m loading you up with websites, here’s a short video I produced regarding the HepvO valve. You’ll also find more helpful information at the Drain Master website. Hope this helps! At least it will keep you busy for a while!